Here is day 1 burger dinner. Bacon Cheeseburger from Five Guys (first time I’ve been there, pretty good! ), home made chicken burger with mayo, butter and avocado, 2 glasses of red wine, curly fries and sweet potato fries. I needed to get in a few extra calories after this so I ate 2 x salted caramel ice cream sticks (only 100 calories each). I have to admit I could have eaten a bit less, I was pretty full after this. About 2000 calories at dinner, 2700 total for the day. The 2018 race weight project has launched! Day 6 – the best burger EVER? 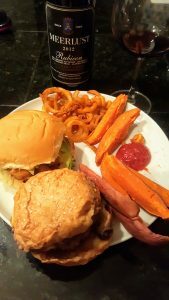 This entry was posted in Nutrition, Race Weight and tagged burgers, race weight by Rob Gray. Bookmark the permalink.